So the dogs are here to stay unless they threaten the baby, which so far does not seem to be a problem. They are only threatening to send me over the edge and need to be admitted to a mental institution. Today was a very big day in the Adams household. Jack and I tried to go see Joe perform in court. We dressed up, got ourselves down there, went through security, banged our way into the courtroom (everyone looked back at us, I was very embarrassed), and we were way too early. So we had lunch with Grandpa Vince and scooted home quickly to feed Jack. It was going to work out perfectly – he was due to eat around 1, we would run back to the courthouse and he would fall asleep just in time for Joe to examine the witness. As I was getting ready, washing my hands, adjusting my top, the boy fell asleep. Now I have one very big rule with children. NEVER wake a sleeping baby. NEVER. I don’t care if the world is ending. Let the baby sleep through it. So here I am thinking, ok, he doesn’t usually sleep for more than 30 minutes anyway, I’ll wait. It is almost two hours later and guess who is still asleep? Notice a few things. 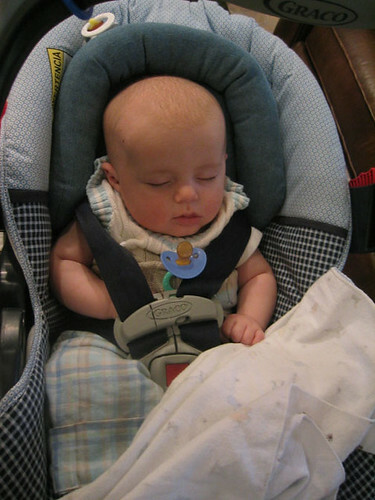 He is not even unbuckled from the car seat. His pacifier is exactly where it fell out of his mouth. (He was awake when we got here, sucking on the pacifier and staring at Lucca while she barked.) He has not moved one inch in two hours. On the bright side, he is getting a good nap. But I missed the examination of Joe’s witness and I am very sad about that. It’s not often you get to go watch someone do their job. Oh well, maybe next time. On another note, it has been relayed to me that one of Parley’s friends made a horrible comment at their Oscar gathering Sunday night. Julia Roberts (who, incidentally, delivered her twins the day after Jack was born) got on stage and someone said “Wow, she’s had plenty of time to lose all that flab.” Now Parley thinks they may have been joking. But this type of comment is exactly what is so hard about getting rid of your baby weight. Sure, your friends will tell you “Nine Months On, Nine Months Off”, but no one else in society seems to agree. As a new mother, you are expected to manage this little creature, learn everything there is to know about raising an infant, sleep the same amount as a political prisoner and still have the energy to get to the gym. And I think Julia Roberts looks fantastic. Yes, her chest is a little large, but if she’s breastfeeding twins I can see why. I myself popped a button off a shirt just this morning and I only have one baby to feed. I swear it wasn't me. I was the one making fun of Rene Zellwegger (open those eyes please). Plus I'm in no position to be making jabs at people trying to lose weight. On another note, your Jack and my cousin's baby Jack are just about the same age. I don't know why I didn't think of that before. Brooke – I too thought Julia looked fantastic – but let’s not forget she has a Nanny and an assistant to help her with her babies. She probably also has a trainer to help her weight. You are doing great! Screw anybody who does not think so!